Identify cooking jobs necessary to complete a recipe by referring to a written recipe or verbal description of the cooking process. Work as a group to distribute cooking jobs between all group members so that every group member is satisfied with their assigned task. Carry out individual cooking tasks with an understanding of how those tasks fit into the larger group goal: creating the meal. Specifically, students will be able to time the completion of their cooking tasks in relation to the timing of other groups. Work with their table groups to identify the cooking jobs necessary to complete the meal by referring to the written recipe and verbal description of the cooking process given by the teacher. Break up jobs between themselves independent from adult help. Teachers will prompt for awareness of self and others, and a more inclusive group process if every group member is not initially satisfied with their assigned task. Coordinate across recipes to complete each component of the meal at the optimal time. Welcome students back to the kitchen and introduce the Independence Series. Explain that this is the first of three kitchen lessons they will have this fall. These three lessons will focus on the themes of seasonality and independence in the kitchen. Describe how, over the course of these three lessons, the teachers will be looking for the students to develop even more independence over the cooking process. This means that not only will we expect them to be doing all the physical work of cooking and cleaning, but we'll also be looking for them to do more of the mental work. Ask students: What do you think I mean when I say we want you to do more of the "mental work" in the kitchen? That means figuring out what jobs need to be done, dividing up work within their groups, and coordinating with one another to make sure everything gets done in a timely way. Increased independence in the cooking process will also require more sophisticated collaboration skills. Explain that as teachers, we pay a lot of attention to how the process of splitting up jobs feels, and always aim for fairness—we want every group member to feel seen, heard, and excited to be part of the group. Encourage students to pay attention to group dynamics as they work with one another. Is every's voice being heard? Does everyone in the group seem content with the group process? Ask if there are any students who love cheese. Explain that today we'll be making a very simple, very delicious fresh cheese called ricotta. 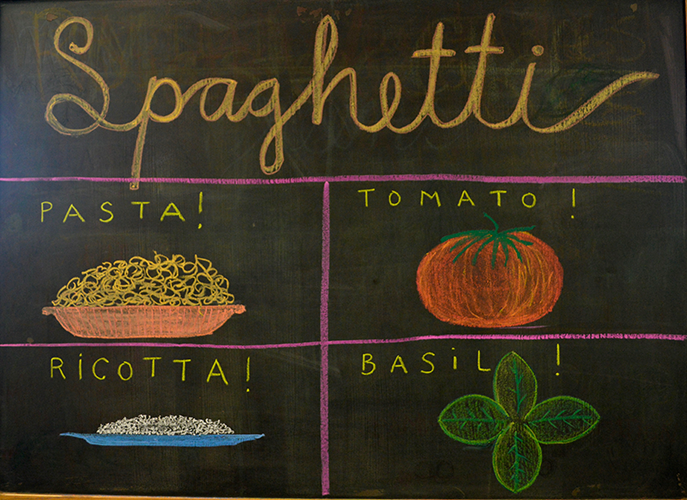 In addition, we'll be making spaghetti, and a fresh tomato sauce and basil pesto. Explain that fresh tomato sauce and pesto are highly seasonal recipes that make use of the late summer harvest. Ask students to wash their hands and break into their table groups. Students divide up work amongst themselves, prepare the spaghetti recipe, and coordinate timing. Table group check-in: If you could have an unlimited supply of one fruit or vegetable growing in a garden near you, what would it be? What is your favorite way to eat pasta or noodles? Explain that today students will organize themselves into recipe groups (fresh tomato, ricotta, and pesto). They are also responsible for dividing up jobs within their recipe groups. Note that because there are three recipes and each one requires the stovetop at some point. Because there are only two burners, they may have to coordinate timing between groups to make sure all the food gets cooked. Also note that the pasta shouldn't get cooked until later on in class so that it doesn't end up getting cold before eating. Emphasize that all the information students need about how to prepare the dishes appears on the recipes—both the ingredients and the directions—so reading the recipe closely, and communicating between groups, will be key to successfully preparing the meal. Turn it over to the students to break into groups by recipe. Set the table and eat. While eating, debrief with the group on how the team worked together. Brainstorm other possible toppings for spaghetti or other foods they could eat with pesto, ricotta, and tomato sauce. If there is time, ask students to share other foods they could make with pesto, ricotta, and tomato sauce. Alternately, students can share a secret talent that they have. Teamwork and independence in the kitchen: This was the first lesson back in the kitchen for our eighth-grade students after the summer. Our main goals in this lesson were: to reorient them to the space , reemphasize the importance of teamwork and collaboration in kitchen class, and start setting them up to work with less direct support from the teacher in all of their coming lessons. Dividing up the jobs: In general, we allowed students to negotiate among themselves how they divided the work. We often fond that – just when it reached the point that we'd be tempted to intervene to make sure that everyone's voice and needs were being heard) – the students would self-regulate and bring in quieter voices or adopt a more consensus-based way of decision-making. If it seemed as if some voices were overly dominant or there were students whose needs and preferences were being overlooked entirely, we tended to intervene with a specific reminder to exercise self and group awareness. Have we heard from everyone in the group about their preference for a job? Making the ricotta cheese: The students were very excited going into this lesson about the prospect of making cheese. The first few times we taught this lesson, a number of our students didn't enjoy the texture and consistency of the ricotta cheese. We found that modeling enthusiasm and interest in the transformation of milk to curds and whey with the addition of the acid (and explaining the chemistry behind the change) encouraged our students to show the same curiosity. This made the ricotta more popular. Making sure to add enough salt was also crucial to making a delicious cheese that was popular with the students. Making the pesto: The students making pesto will often need prompting to realize that making pesto in small batches instead of all at once will yield a more even texture. You can also remind them that exact proportions of each ingredient are not necessary for each batch. Everything will be mixed together in the end. Timing: This is an excellent lesson to prompt students to think about the timing of the meal, especially because pasta is something many of them will be familiar with cooking. Making the tomato sauce: Because our main goals in this lesson were to build independence and teamwork, we offered the students the option of cooking the tomato sauce or keeping it raw. Cooking the pasta: Pasta should be cooked about 20 minutes before the group eats. Too early, and it will get cold and soggy. Straining pasta: This job can be difficult and feel scary to some students. Offer to assist or support if necessary.